A part of the wonderful set of icons called the Great Deisis from Holy Dionysiou Monastery on Mount Athos, which includes Our Lord Jesus Christ (J52), the Theotokos (T59), St. John the Baptist (S297) and St. Peter (S299), these masterpieces were painted in a.d. 1542 by Euphrosynos the Cretan. Here St. Paul is shown reaching out in supplication to his Lord Jesus Christ in intercession for us. 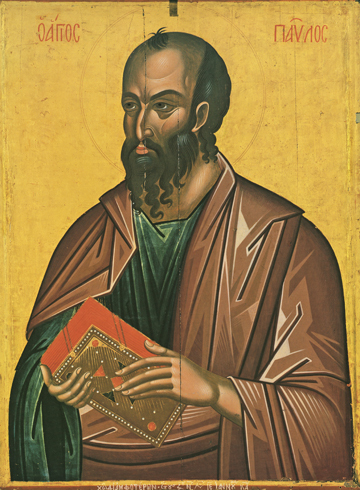 St. Paul also carries a book of his Epistles with him, proof of the amazing and profound conversion that he went through after Christ spoke with him on the way to Damascus, and subsequently “Turned the (pagan) world upside down” (Acts 17:6). In the life of St. Paul, we can say that the words of the Prophet David, “Zeal for thy house has consumed me” (Psalm 69:9) most aptly apply. Deisis icons are quite common in sets on the iconostasis, or icon screens, in many Orthodox monasteries and churches. This intercession of the Saints for us in love to the Saviour is an expression of the Communion of the Saints, which is the condition of all the Faithful who have come to live in Heaven. May we begin to experience this love and intercession even now on earth!